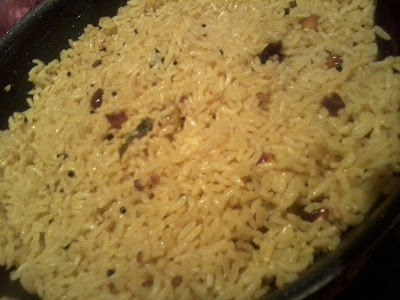 Its a very common variety rice made when u have a long time travel.This is simple also to do.And here comes the recipe. Tamarind juice-lemon size tamarind soaked in hot water. Heat gingely oil in a pan.Add mustard seeds and curry leaves and allow to splutter. Then add in the peanuts and roast in the oil.Add the extracted tamarind juice,salt and bring to boil.Wait till oil seperates on the top.Then allow it to cool. Add the boiled mixture to the cooled rice and mix well.Check for salt.Can be had to thogayal.